Sanders hails the civil-rights activist, union leader, progressive candidate, and crusader as a hero who forged a new politics. When Bernie Sanders was barnstorming across Wisconsin in the spring of 2016, just days before the state’s critical presidential primary vote, his schedule was packed with policy addresses, rallies, and media interviews. Yet he took one afternoon off and went to the Madison home of Ed Garvey to spend time with the man Sanders and the Rev. Jesse Jackson and the late Senator Paul Wellstone hailed as an ally and an inspiration for their progressive political campaigns. Garvey, who died this week at age 76, never held elective office. Yet he has a profound influence on those who did, including Sanders, who on Wednesday referred to the Wisconsinite as “one of the smartest, funniest and most decent people I have ever known.” His bids for the US Senate and the governorship in Wisconsin in the 1980s and 1990s framed a new political vision that erased the barriers between grassroots activism and electoral politics—and envisioned a day when elected officials would spring from movements and make it their mission to implement the programs of those movements. Garvey was a movement man—a civil-rights campaigner who went south in the early 1960s with the Student Non-Violent Coordinating Committee (SNCC), a student activist who served as president of the National Student Association, a labor activist who was the first executive director of the National Football League Players Association; a brilliant lawyer and legal strategist who organized and advanced the long struggle to apply antitrust laws to the NFL and won major concessions from the owners. “They hated Ed because he challenged their right to own men,” recalled DeMaurice Smith, the executive director of the NFLPA, who on Wednesday recognized Garvey’s steady determination to link civil rights and labor issues. “Ed [pushed]the union philosophically toward issues he called ‘freedom issues.’” When he left the union and returned to his native state, Garvey crusaded for environmental protection as a deputy attorney general of Wisconsin, and then represented labor and community organizations across their country in their struggles with multinational corporations. In 1986, Garvey’s bid for a United States Senate seat representing Wisconsin drew national attention as he built a rainbow-coalition campaign—like the presidential bids of his friend and longtime collaborator on progressive causes the Rev. Jesse Jackson. Linking labor and environmental groups, urban workers with farmers, women’s-rights campaigners, and the LGBTQ community into a mass-movement campaign, Garvey secured the Democratic nomination. 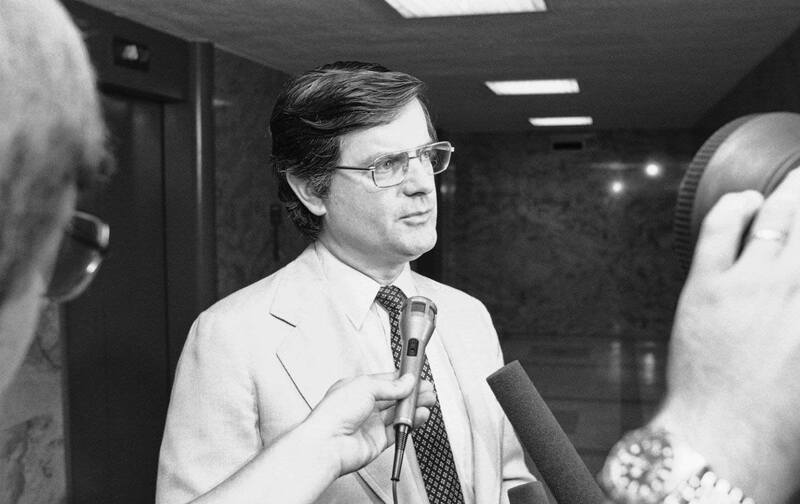 Building on the populist approach that his friend Jim Hightower used to win election as Texas agriculture commissioner in 1982, Garvey appeared to be headed for the US Senate when his opponent, Republican Senator Bob Kasten, launched a heavily funded smear campaign that lied about Garvey’s background. Kasten, who was supported by millionaire campaign donors and special-interest groups from outside the state, narrowly prevailed with what at the time was characterized as one of the bitterest campaigns in modern American history. Only later, when faced with a libel suit, did Kasten concede that the free-spending attack-ad campaign was false. Ed Garvey’s reaction to his electoral setback was to start organizing against the big money that paid for attack ads–and the warping of American political campaigns by wealthy donors and corporate interests. A groundbreaking article he wrote for The Progressive, “It’s Money That Matters: A Candidate Looks Back In Anger,” still turns up in textbooks on politics. It was that article that inspired Paul Wellstone, a Minnesota college professor, to consider making an outsider run for the US Senate as a crusader against big money and dishonest politics. The 1995 book Mr. Wellstone Goes to Washington recounted how the professor’s “eyes lit up” when he read Garvey’s writing in The Progressive and began to think that “the time might be right for running against money.” It was. Wellstone was elected to the Senate in 1990, in the same election that saw another friend and fan of Garvey’s approach to politics, Bernie Sanders, get elected to Congress from Vermont. Garvey made his last bid for public office in 1998, securing the Democratic nomination for governor of Wisconsin with a campaign that accepted only contributions of $100 or less. With another reformer as his running mate for lieutenant governor, Garvey outlined a democracy program that inspired a new generation of activists in the state. He drew enthusiastic support from Wellstone, who campaigned at Garvey’s side in small towns and cities across Wisconsin. Jackson showed up as well, touring African-American churches in Milwaukee with the man who had been one of the most ardent supporters of the civil-rights advocate’s 1988 president bid. Garvey organized Wisconsin’s annual Fighting Bob Fest celebrations–named for former Wisconsin senator Robert M. La Follette—which over the years drew tens of thousands of people to hear Sanders, Jackson, Hightower, and others, as well as the new generation of grassroots activists and candidates he was inspiring to seek and win races with Garvey-style campaigns.